The Mesh Deform Modifier allows an arbitrary mesh (of any closed shape) to act as a deformation cage around another mesh. The Mesh Deform Modifier is reasonably easy to use but it can be very slow to do the calculations needed to properly map the deform mesh cage to the deformed object. The name of the mesh object to be used as a deforming mesh cage. An optional vertex group of the object’s mesh to restrict the vertices that will be affected by this modifier. Vertices not in this group will not be deformed. Inverts the influence of the selected vertex group, meaning that the group now represents vertices that will not be deformed by the modifier. (The setting reverses the weight values of the group). The Precision number button controls the accuracy with which the deform mesh cage alters the deformed object, when the points on the cage are moved. Raising this value higher can greatly increase the time it takes the Mesh Deform Modifier to complete its binding calculations, but it will get more accurate cage mapping to the deformed object. This setting becomes unavailable once a cage has been bound. When activated, other mesh altering features (such as other modifiers and shape keys) are taken into account when binding, increasing deformation quality. The setting is deactivated by default to save memory and processing time when binding. Like with Precision, this setting is unavailable once a cage has been bound. Links the current vertex positions of both the modified geometry and the deformer Object chosen together. An unbound Mesh Deform Modifier has no effect – it must be bound so that altering the shape of the deform mesh cage actually alters the shape of the modified object. Depending on the settings of the Mesh Deform Modifier and complexity of the deform mesh cage and/or deformed object, it can take a long time for this operation to complete. This can result in Blender not responding to user’s actions until it has completed. It is also possible that Blender will run out of memory and crash. To be safe, save your blend-file before proceeding! 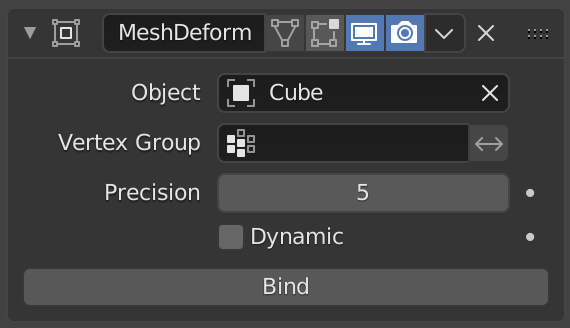 When a deformed object has been associated to a deform mesh cage, it can later be disassociated by clicking the Unbind button which replaced the Bind one. When Unbind is clicked, the deform mesh cage will keep its current shape; it will not reset itself back to its original start shape. If you need its original shape, you will have to save a copy of it before you alter it. The deformed object will, however, reset back to its original shape that it had before it was bound to the deform mesh cage. Significant changes to the entire change mesh (such as rotating the cage upside down) can cause noticeable artifacts. These can be reduced by binding with a higher Precision, however, it is a known limitation with this modifier and cannot be avoided entirely. Ensure that the normals on the cage mesh point to the outside; they are used to determine the inside and outside of the cage.